There's a place over in Sonoma County, the tour guide tells the group, that's a little over the top. "It's kind of like the Disneyland of wine," he says, as we sit on pews under an arbor, the better to reverentially gaze upon Napa Valley's historic To Kalon Vineyard. I don't know if anyone else in the group thinks this is remotely funny or killingly ironic, but it's a good thing I'm not drinking Cabernet Sauvignon right now, because it just might've sprayed out my nose. 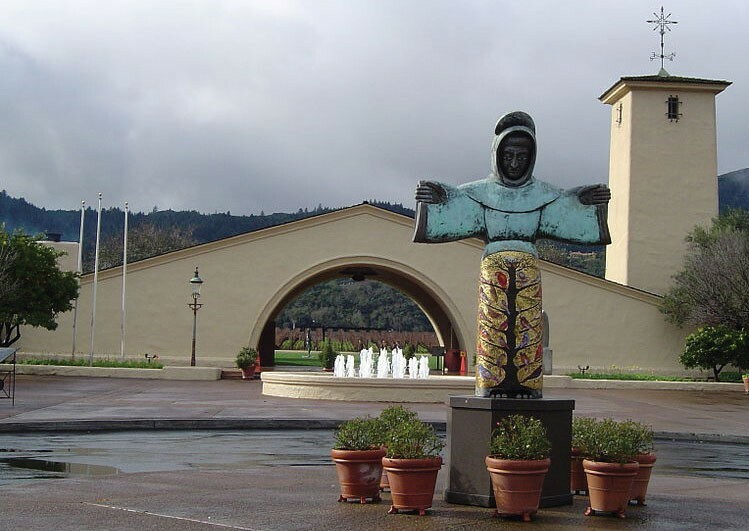 We're at the third stop of the tour at Robert Mondavi Winery, the California-mission-styled facility for which the epithet "iconic" is forever fresh. Mondavi's gambit, the well-known story goes, was a game-changer who inspired those that followed to create what wags have called a "wine Disneyland" along Highway 29. He was so closely identified with the success of California wine that when the actual Disneyland wanted a taste of wine country in its California Adventure theme park, Mondavi briefly operated the Golden Vine Winery there. That's all gone now, as well as namesake Robert Mondavi, who would've turned 100 last year had he not passed on in 2008, his life's work already absorbed by the corporation that cut its chops on Wild Irish Rose. But hell, this is still sacred ground, blessed at the beginning of harvest every year since 1966. Even if Mondavi needs no introduction, there's little point in choosing the bar over the tour, which begins in a humble stucco room for a history lesson, winds through the cellars, and ends with a sit-down tasting complete with empanada snack. Taking the genre to a new level, the 2011 Napa Valley Unoaked Chardonnay ($34) has hints of toffee and pear candy but ends up more like a darn good Pinot Grigio than a Chardonnay of any description. The 2011 Carneros Pinot Noir Reserve ($60) is a plump sweetie of a Pinot, spoiling tasters with all kinds of cherry licorice, clove aromas and vanilla and licorice flavors. Least costly on the menu, the 2011 Napa Valley Cabernet Sauvignon ($28) is the flagship wine here, and still sports 30 percent To Kalon fruit in the blend. With an aroma reminiscent of the fermentation room that we just left, it's got a lithe, gentle palate of black licorice and blackberry pie that belies its brooding color and aromas. After the affable tour guide pours everyone a final sip of Moscato, we find ourselves once again beside the St. Francis of Assisi statue in front of the winery. I wonder if his arms are outspread in a blessing, or cryptically pointing in two possible directions. Robert Mondavi Winery, 7801 St. Helena Hwy., Napa. Daily, 10am–5pm. Signature Tour, $30; family-friendly Discovery Tour, $20. 888.766.6328.